This charming antique Redwork Quilt is sweet and in some ways, whimsical. Its appeal is not only that each of the 49 embroidered blocks are different, but also in wondering if there is a story being told. Research gleaned suggests maybe so! Read the history of "redwork", Grover Cleveland (whose name is also embroidered in a block), and British illustrator Kate Greenaway whose work may have inspired some of the designs, and then decide for yourself. Pictures are included as part of the historical research. Measuring approximately 70" square in total, each original embroidery is on a 8 1/2" finished block. The border motifs are embroidered on 5" wide strips. After piecing the 49 blocks to each other, the needleworker covered the seams with a version of the feather stitch. Sweet and appealing, any of the motifs could be used for different projects including shams, crib quilts, wallhangings, pillow cases, tea towels - even framed blocks to commemorate an event such as a wedding or birth! 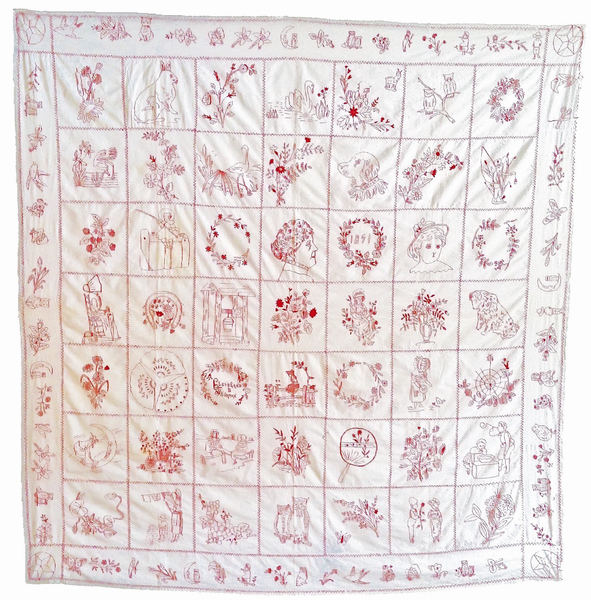 The original quilt is embroidered in a "red" floss that actually has a pink tinge to it. I have found a Presencia floss that matches so closely it took my breath away when it arrived! The quilt would also be lovely in blue embroidery floss or even in a multiple of colors! 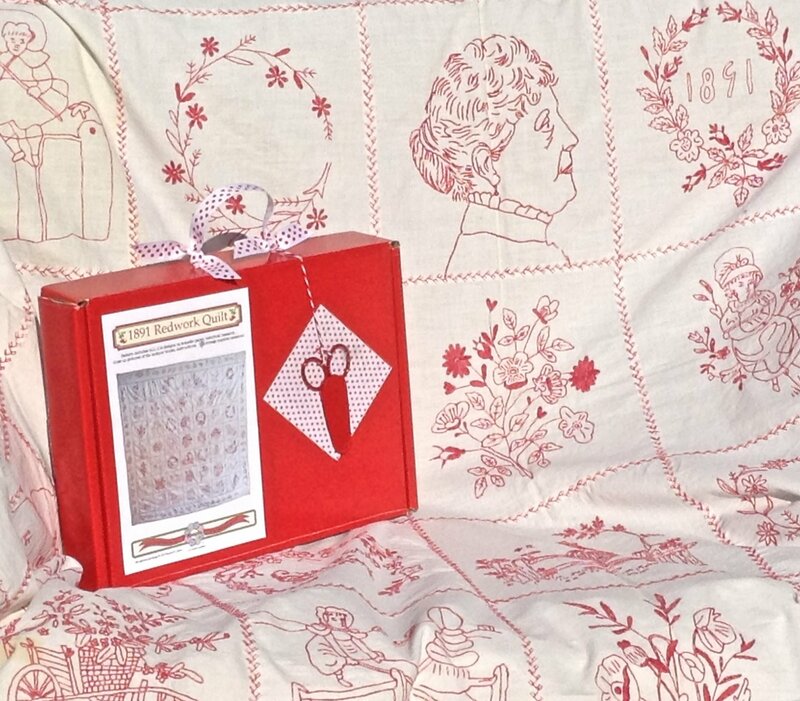 In addition to the historical research, The Redwork Boxed Set includes iron-on transfer patterns for each block and border motif, close-up color pictures to enable a better view of the embroidery, graphics of the embroidery stitches used, instructions with fabric requirements, AND an adorable pair of vintage-inspired 4" scissors!! Not only is this an authentic reproduction of a very heartwarming quilt, but it also inspires a wonderment and curiosity as to what the original needleworker may have been hoping to impart! If you prefer only a few of the patterns, they are issued in separate envelopes (Volumes) and can be purchased separately. As always, actual shipping may be lower than what comes up on the order page.